I strive to keep things simple and organized, especially in emails and written procedures (and procedures written in email). 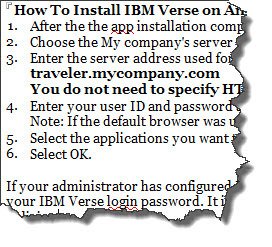 Up until today, I struggled with using what should be a very simple text organization tool in IBM Notes, the Number List style. My frustration is that it doesn’t work similarly to other popular number listing solutions. In IBM Note’s case, if you have a hard return, it goes to the next number. If you skip a line, it numbers that skipped line. If you turn off numbering for that skipped line, the next line starts at 1 again. Today I quite accidentally solved the riddle. Use <Shift> <Enter> at the end of the line to allow the next line to remain part of the previous numbered line (with proper indention).